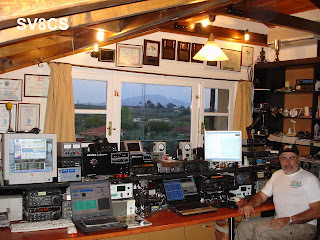 This is my shack on Zante island (EU-052) in western part of Greece.At my right hand is the YAESU FT-2000. My IC-756 it is not show in the photo because i left it in Morocco (CN3A & 5F3COM) for contesting.My shack is configured for SO2R with the EZ-Master. The Kenwood TS-2000 is used only for 2m and 6m EME contacts. Mosley PRO-67C (40-30-20-17-15-12-10m) at 30m high tower.HY-Gain Long John 5 elements monobanders for (20-15-10m) at 27m high tower.HY-GAIN 7 elements (DB-1217) for (10-15m), para sleeve driven element, at 12m high tower, together with 6 elements for 6m antenna by (I0JXX).Full size vertical for 160m (tower 30m with gama match), 2 elements delta loop, bidirectional for 80m and dipoles, INV-V for 40-80-160m.Also 5 beverages for low band RXing. FOR 2m and 6m EME and Es. 4X16 elements (10wl), for 2m, by I0JXX and 1X6 elements,for 6m, by I0JXX at 11meters tower, with full AZ and EL. For UHF EME 2X19 elements Tonna and 9 elements cross for 2m (SAT operations) and 35 elements for 23cm at 11m above ground.